Some 1,200 city planners, transportation professionals, city officials, and journalists crowded into the San Francisco Hyatt Regency this week for the 2016 Rail~Volution conference, a gathering aimed at “building livable communities with transit” in cities and towns across the country. 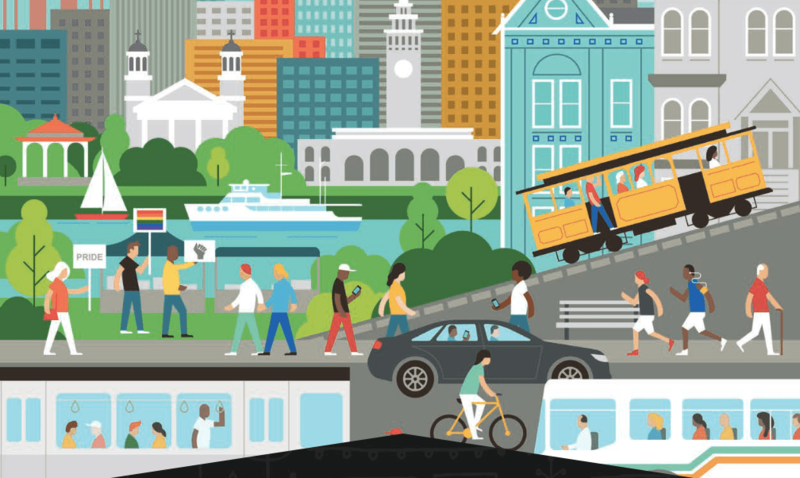 The… conference brings together thought leaders and innovators to discuss the relationship between public transit and land-use, examine best practices in transit-oriented development, and look at how to maintain diversity and inclusion in the face of a changing urban landscape. Still, Heminger, Cutler, and other speakers were positive about the outlook for the Bay Area, pointing out that many problems — like housing and the overcrowding of BART — are also a function of economic success. There’s so much demand for housing because high-paying jobs have attracted so many people to the region, they said. “The innovation of Silicon Valley is not a bad thing — but we have some catching up to do,” Heminger said. “But I’d rather be catching up with economic development” than not having it in the first place. Hat tip to Streetsblog SF‘s Roger Rudick for the coverage. Streetsblog Denver was there too — stay tuned for more takeaways relevant to the Mile High City, home of Rail~Volution 2017.